Our house toast – A medium flame and light water treatment gives a toast penetration of 3-5 mm and a toasted bread colour to the wood. This helps to produce wines of character, body and a supple round, fleshy mouth feel. Aromas of chocolate, coffee and vanilla are common. (Also available in M- and M+ the difference is time on the flame). Frequent water combined with a medium flame ensures a gentle light brown toasting that penetrates into the wood 6- 7mm. This long toast reflects the aromatic and structural profile of the barrel adding elegance, length, and minerality to the wine. Floral and fruit aromatics are accentuated and framed without wood dominance. Regular water treatment combined with an extended firing at higher temperatures creates our most impactful, deepest toast (7-8mm). This coffee coloured toast adds richness and structure to a wine. The barrel supports the wine, building body and length. The Grand cru is our ‘umami toast’, needs rich ripe fruit or can be overpowering. A lighter toast designed to respect the wine’s fruit. Craie wood grown in these less fertile soils is generally lighter in terms of tannins and aromatic precursors. We use water and steam in this medium-light toast to respect the wood’s delicate structure and to prevent the development of strong toast aromas. This technique also allows a deep penetration of the heat, avoiding any sappy aspects to the barrel. 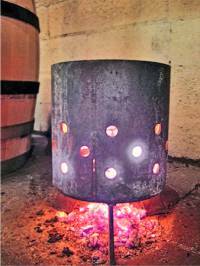 Recommended for short oak maceration between 6 and 10 months. At the opposite end of the spectrum to the GC, the CLL is delicately toasted over a low flame of oak embers. Its honey coloured profile penetrates 3-5mm, thus requiring a long slow toast. This, very light toast, has minimal aromatic impact on the wine but adds a freshness and suppleness, which imparts to the wine brilliance and luminosity. Our experience is that this toast needs at least 12 months to fully integrate into the wine. The CLL toast is only offered with 30 month air-dried “Selection Nicolas” oak, 27mm or 22mm. Born from an experiment with Domaine Dujac pushing the CLL boundary. A “cool fire” with a short toast period over a low flame of oak embers. It is around half the time than CLL. The oak stays very fresh. This toasting has to be used on a very high quality grapes and very long oak ageing 20 months minimum to integrate the fresh oak. A light and long toast derived from our classic CLL toast and has been developed specially to get the best out of the “Pierre” wood. In the CLL+ toast, we replace the last minutes of (usual low-temperature) toasting form the CLL by a quick “coup de flame”. This allows us to take advantage of the “Pierre” wood natural richness while preserving its structure.